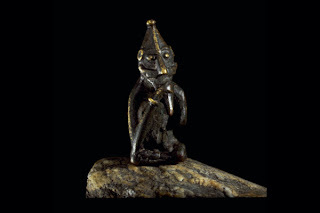 When I saw these Irregular Goatman Warriors (GOAT1), the first thing that came to mind were Gloranthan Broo. 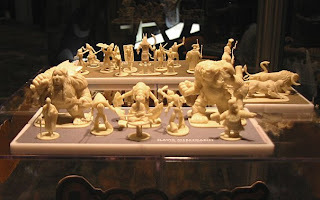 They are crudely sculpted, but it does not detract from the figures. 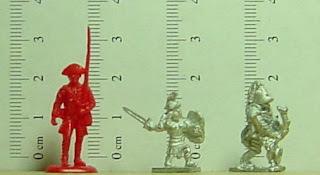 As with all 15mm Irregular miniatures, there are about a bajillion different variants. For the Goatmen, they are armed with a variety of different weapons ranging from dagger to giant club. There is at least one variant with a cape and armor, but I do not have an example of that particular figure. I did some experimentation in limb lengthening with a couple of the goatmen (the two directly to the right of George), and a SLM bugbear. I clipped off the legs, and drilled holes in the upper and lower halves for one goatman and the bugbear. The bugbear received standard straight pins in the legs, while bent pins were glued in place for a goatman. I found it more difficult to regulate the height of the miniature with bent pins, but the results turned out quite nice. Kneadatite was used to reinforce the bond between the pins and the lower legs before the upper body was glued in place. For the second goatman (holding pan pipes), I tried a different technique to increase height. Using a pair of pliers, I compressed the metal in the legs until the goatman was as tall as the figure modified using pins. I then bent the legs so they would be articulated in a goat-like fashion. The process is simple, but leads to metal stress in the legs. I'm still debating whether to use Kneadatite or Bondo to reinforce the legs of the second goatman, as the articulation points in the leg are quite fragile. For the other miniatures, Kneadatite was used to reinforce the join between the legs and upper body. It was also used to flesh out the legs. The bugbear will get a second treatment of Kneadatite, since his legs are too spindly at the moment. And since I am covering the subject of creatures part goat and part human, I added a group shot of a SLM faun and satyr, an Irregular goatman, and a SLM goatman skeleton. 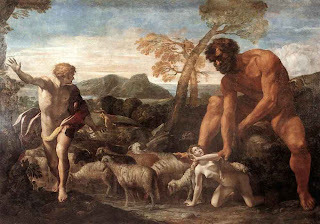 While I like the SLM faun and satyr, I think the size of their heads make them a little too dwarf-like for my tastes. I'll have to keep an eye out for replacement heads, too see if that will make their appearance more palatable. Back in April, there was an article in USA Today about how zombies are becoming the most popular type of undead in books and movies. 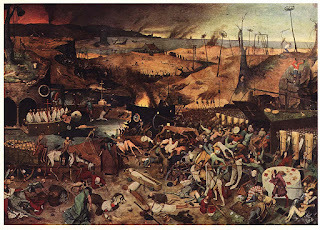 Zombies are certainly the most popular type of undead in miniature wargaming nowadays, but the motif has probably been popular since even before Bruegel the Elder. I'm not really up to speed on the latest zombie miniatures, but I imagine that the vast majority of these shambling hordes are either WWII or modern zombies. 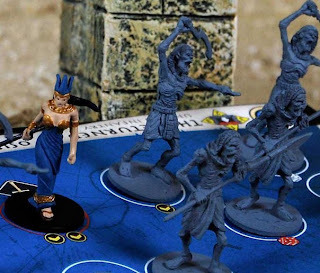 In the fantasy genre, I've found ghouls and zombies from Splintered Light Miniatures. The first two figures below, are from the Ghouls set (UNDE14), the next three figures are from the Zombies with Mixed Weapons set (UNDE18), and the final three figures are from the Zombies with Spears set (UNDE20). These are all true 15mm miniatures, and even the largest of them would need some modification to work as 1/72 zombies. The sculpts are solid, but not particularly detailed, outside of some rotting flesh and spilled entrails. I found the eyes particularly creepy, and the miniatures would probably look eerie painted up with bleached out zombie eyes. Putting zombies aside, the true staple undead of the fantasy genre is the skeleton. 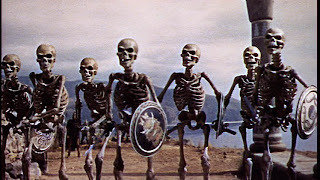 I'm sure that many old school gamers were influenced by Ray Harryhausen's skeleton warriors in Jason and the Argonauts and The 7th Voyage of Sinbad. This set of images below, is of three Skeleton Goatmen (UNDE09), followed by two human skeletons from the Skeletal War Mammoth set (UNDE21). 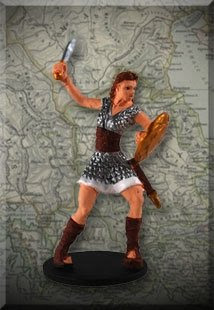 Again, these figures from Splintered Light Miniatures are true 15mm miniatures. While the human skeletons are definitely too small for use as 1/72 skeletons, I think the goatman skeletons would be fine. I really like the look of the entire line of skeletons produced by Splintered Light Miniatures, and only wish that they were larger so I can add them to my undead army. The next batch of skeletons are the Undead Melee Troops (FO35) from Black Raven Foundry. 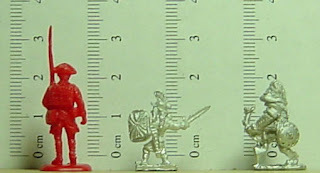 These figures range in height from 15mm to 20mm, and are much more robust than the SLM skeletons. 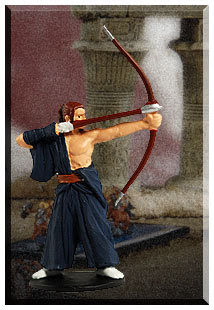 They come in a nice range of poses, and are good candidates for conversion to 1/72 scale. 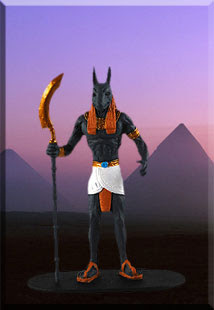 Also included with the Undead Melee Troops are three command figures. The BRF skeletons are all very unstable because of their narrow bases, but this should not be a big deal if you base your miniatures.